I can’t think of one reason why people wouldn’t love Chicago. I was lucky enough to have one of my bestest buddies attend the University of Chicago for her undergrad years, so I was able to enjoy four years of the best bars, shops and free lodging this side of I-94. 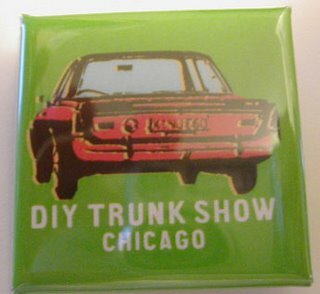 On one of my last trips to the Windy City, I heard kids talking about the DIY Trunk Show. It’s a good thing they did. The fair took life thanks to Amy Carlton and Cinnamon Cooper. 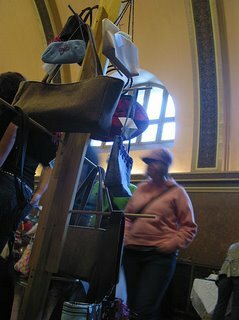 Looking for a way to showcase the many talented crafters in the Chicago area, the fair first opened in 2003 and has been running strong ever since. I had a chance to ask these ambitious fair leaders just what it takes to make a successful event. How long has the fair been running? How many people do you normally have running it/volunteering? When do you start planning for it? We had our first show in 2003, so this will be our fourth year. over the years who help us get the word out and let us hang posters in their stores and stuff. On the whole, though, it’s a two-gal show, which is why it takes us about six months to put everything together. What kind of challenges do you run into making it happen? The first year we did this, neither of us had ever even been in a craft show, much less put one on. We made it up as we went along, then changed the stuff that didn’t work. Every year we learn something new or make something better in the way we put the show on. We’ve improved our application and payment process, so that’s less of a hassle than it used to be. 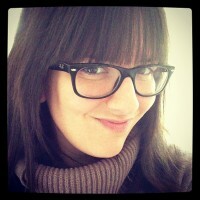 One big challenge is having to tell cool crafters who make awesome stuff that they can’t be in the show. We get so many applications, and we just don’t have room for everybody. Another is getting enough publicity. We have a tiny ad budget, so we really have to hustle to get the word out — putting up posters, sending out press releases, calling in all the karma we’ve racked up during the year to get somebody to link to us or write something nice about us. When we started this we decided that we were more interested in fostering the creation of an environment than making money. So all of the funds that vendors pay to be in the show go toward the expenses of the show, not to us. (Although admittedly last year we splurged and bought a pot of tea and a couple of scones once the show was over with the little bit of money we had left over.) And the low price makes it possible for new crafters to join us as well as makes more established crafters want to be in the show. What’s the best way to promote your fair? Anything free is great — a mention in the Reader (Chicago’s free alt-weekly) will probably be seen by more people than anything else. But since we can’t plan on that, we get our vendors to help with promotion. We send “vendor kits” a couple months before the show that have posters and postcards in them. It’s DIY all the way for us — you want people to buy your stuff, you have to help us get the word out! So we ask the vendors to put up posters in their favorite haunts and send the postcards to their friends, family, and mailing lists. We also create a web banner for all the vendors to put on their own sites. Updating our blog regularly and posting on the crafty message boards help us get our name out there and send people to the site. And we send out press releases — at least three each year with different themes. We’ve gotten some pretty good press coverage through that. What’s the biggest reward for you having an event like this? 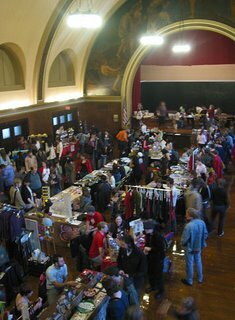 We hold about 10-15 percent of our space for first-time vendors. Cinnamon and I had never done a show before setting up DIY Trunk Show, so we like to give people the chance to do their first show without a huge financial investment. So the best thing is hearing from these folks at the end of the day that they loved it, that people bought their stuff. It’s so empowering when someone wants to buy what you made! And we like to help other people experience that for the first time. We also have free craft workshops during the show every year, so it’s cool to help people learn something new. What’s the artsy/crafty scene like in Chicago? Chicago is just a hotbed of craft right now. It’s so inspiring. DIY Trunk Show, unlike most of the other alternative shows, focuses mostly on local crafters. One of the reasons we do this show is to help small craft businesspeople get to know each other and work together to build the crafty community. In the four years we’ve been doing this show, the city has gone from two annual alternative craft shows to having two annual shows plus a quarterly show, a couple monthly events, and a new thing happening every weekend through the summer called The Lot (like a farmer’s market of craft). At least four new retail shops that specialize in locally made stuff have opened up, too. It’s so incredible, and it’s not slowing down at all – this year we had almost 200 vendors apply for our 64 slots. What one piece of advice would you give to a group trying to start their own fair? other shows find vendors, they’ve helped us promote our show. It’s all good, yo. Puffy stickers or scratch-and-sniff: which rocks more? Are the puffy stickers also sparkly, by any chance? Because that could decide it. Although, Cinnamon is very partial to stickers that smell like, um, cinnamon. It’s just this thing she has. Make sure to check the show’s Web site regularly for news and updates, and most importantly, start planning your road trip now! I know I’m starting to save my pennies for a tank of gas or two.